@Sentosa | Get Your Grub On! We had a very early morning cycling session through Singapore as some of my friends are prepping themselves for the Triathlon in a couple of weeks. Some weren’t exhausted enough after 40ks and decided to have a swim at Sentosa so after refreshing from the ride I made my way out there to join them for brunch at ‘Coasts’ on Siloso Beach. 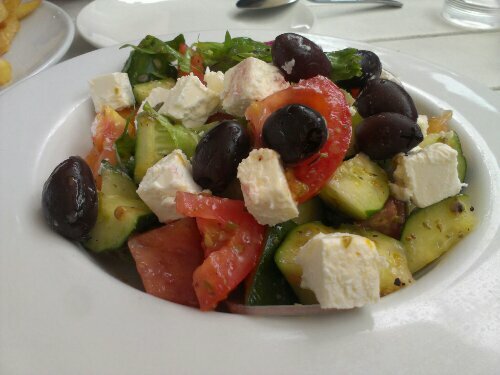 A friend and I shared the ‘Greek Salad’ and as I found ‘Crab Cakes‘ on the menu, my main selection was fixed as well. The salad came first and I actually liked it a lot. It was fresh and the cucumber and tomatoes were cut in big chunks as they are supposed to be. Kalamata olives brought a rich Mediterranean flavor to it but there definitely too little onions involved. I don’t really like feta cheese but appreciated the areas that were touched by it and therefore tasted a bit saltier. My friend must have nearly overdosed on the feta as she had to finish it all by herself. The dressing was nice and simple as you expect it, just mixing a good quality olive oil with a dash of lemon and pepper. Just the salt could have been put forward a bit more. 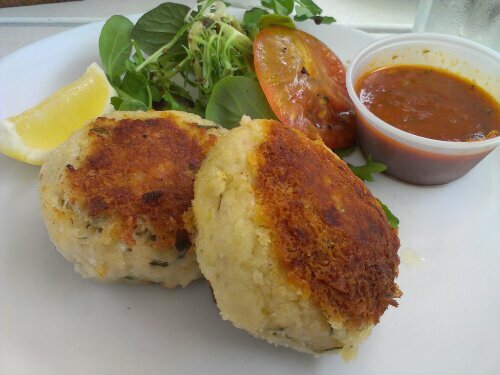 When the ‘Crab Cakes‘ arrived I had a feeling that the amount of crab in there wasn’t really in my favor. Starting digging in I was proven right. Even though it tasted okay there wasn’t too much crab meat there or at least it was outplayed by it’s potato-y doughy opponent. Also it could have used much more of the advertised coriander, much more. One interesting thing was the red tomato based dipping sauce. It was cold and slightly spicy but what I couldn’t nail down was where the fishy, shell-like taste came from. The closest I did get to was a memory of small clams which tasted like this. I couldn’t find any in there and maybe my taste buds just played a prank on me but if I should come back here and it’s not that busy I will try to ask someone. I tend to forget to mention the service but here I didn’t have any complaints. Yes, you had to order yourself at a counter but the staff was very friendly and the delivery of drinks and food was fast especially considering the amount of people here. I might come back but so far more due to the fact that it’s situated directly at the beach, the food has yet to convince me.